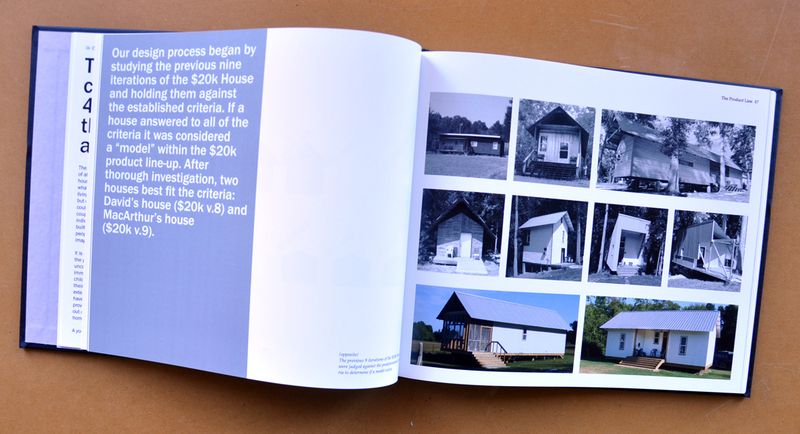 Rural Studio is a design-build architecture program founded in 1993 by Auburn University professors Samuel ‘Sambo’ Mockbee and D.K.Ruth. Their goal for the program was to teach architecture students about the social responsibilities of the architectural profession through the design and construction of decent, affordable, and beautiful buildings. 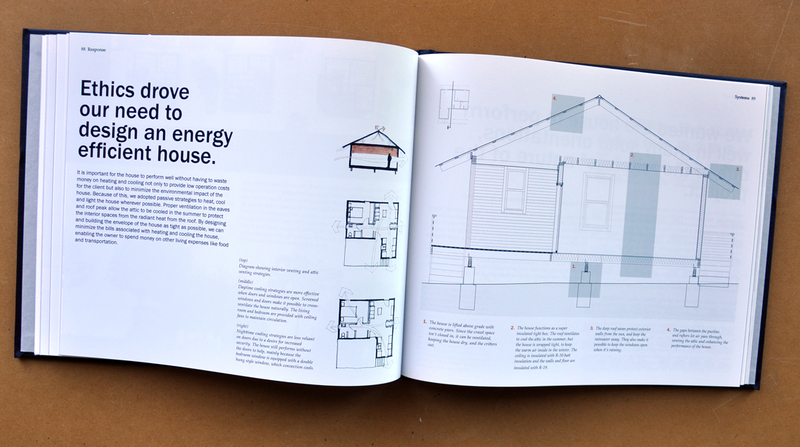 Evolving out of the Rural Studio was the $20k House project, with a goal of moving beyond the construction of single family residences towards more ambitious and long-term community projects. 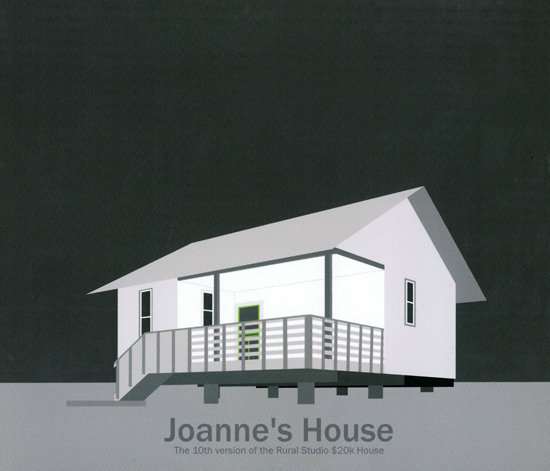 This book is the result of the design and construction of the 10th $20k House – Joanne’s House. 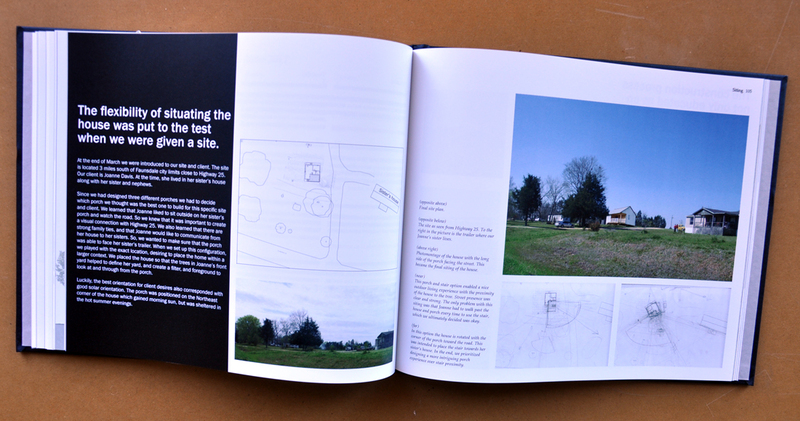 The team that made up this project was Jacob Beebe, Erika Henriksson, Eric Schmid, and San Yubero. I have long been aware of the $20k House project and had a chance to get to know 2011 participant Eric Schmid before he join this project. 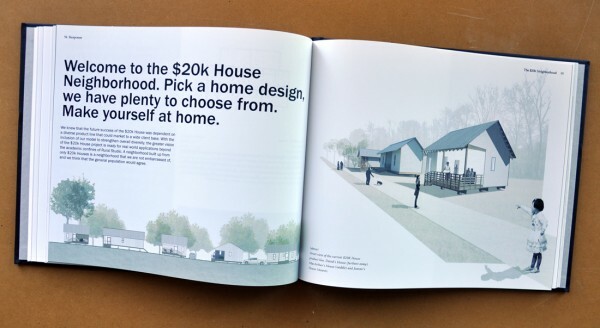 I have also been lucky to have Eric write on this site before – the first time was an introduction to the $20k House Project (here) and then an update on the house (here) that included a “best of” set of links to the $20k House blog site – which is full of insight and enthusiasm. I received this book in the mail as a wonderful gift from Eric, and I have since searched for where I could send you to buy one – it is a fantastic book and I believe it’s the first book of its sort from the $20k House studio and if this is something that all subsequent projects aspire to create – a road map of decisions and processes, the bar is set incredibly high. 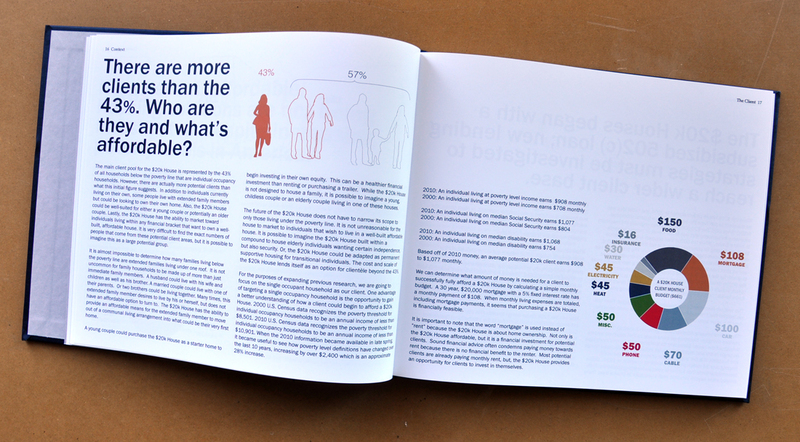 Each section is essentially made up of small individual essays – none longer than 4 pages, with the majority a brief and concise 2 pages – each topic and point diagrammed with fantastically construction info-graphics. I can’t tell you much I loved reading this book. It was insightful in a way that is only achieved by people doing something for the first time and articulated by passionate and dedicated young people. They shared their passion and the lessons learned from their experience building this house. They share their intentions, how they spent the money, how they developed their solutions, and the reasoning behind the priorities they set. 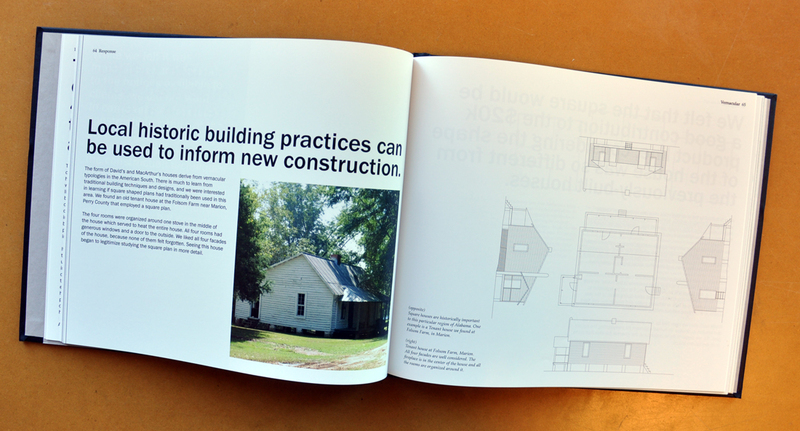 It is an honest look at how the house was built and how this house will impact the community where it resides. There should be a donation form in the back of this book. I know that the book was self-published but I don’t know if there are any plans at this point to make it available for purchase. 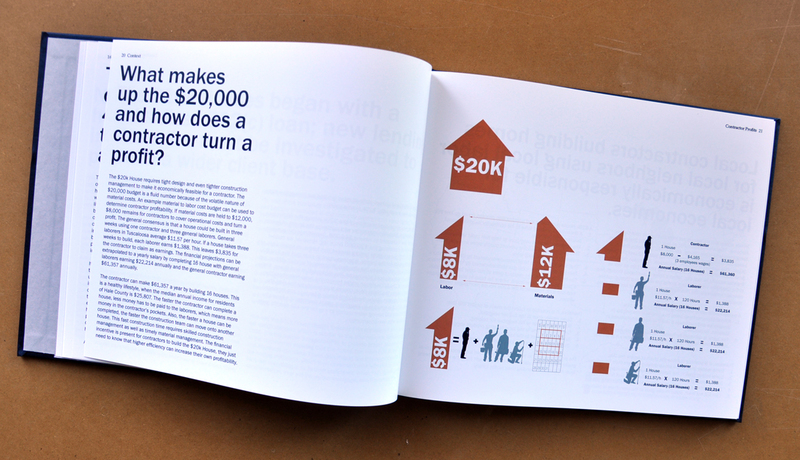 That’s really too bad because I would have every architect I know buy a copy of the book because this group of people – and the things they are doing – are good for the profession of architecture and for the image of architects.